On Saturday, September 7, our group paid a visit to the Aldergrove Fall Fair. The organizer of the fair is herself a victim of propane cannons and she insisted that we attend the event. We were even provided with a free booth directly opposite the speakers podium. We arrived on Saturday morning and set up our presentation area by 10:00 a.m. Things began to get rolling by 11:00. Many folks passed by and gave us nice words of encouragement or asked for more details about the propane cannon issue. 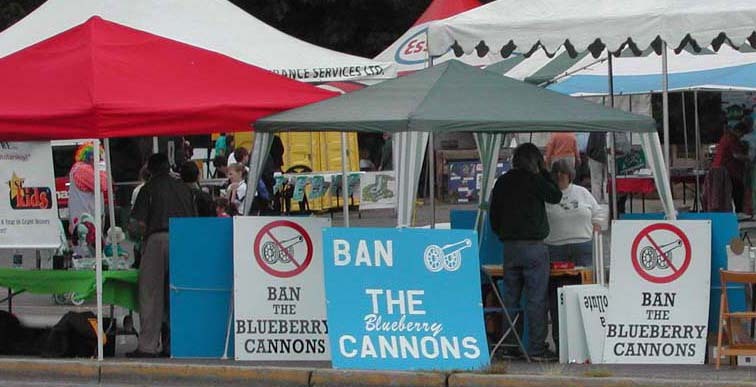 Cannons are a particularily hot topic in Aldergrove because there are so many blueberry farms in the South Aldergrove area. Many more asked to sign a petition opposing the use of these noise polluting devices. One informed gentleman (seen in the photo to the left) was particularily interested in discussing our propane cannon noise predicament. He also happened to be well connected with the Ministry of Agriculture, and he suggested that our group arrange a meeting with the Minister, to discuss the problem of propane cannons further. A meeting will be arranged in the October timeframe, thanks to this gentleman. This event is an excellent example of a small town country fair. People attended displaying their farm animals; 4-H events were taking place; people had home grown fruit and vegetables available for sale; information booths were set up showing the steps involved in preparing and baling hay; spinners, weavers and all sorts of artisans were present; etc. etc. Out of all the examples of farming activities on display not one uses propane cannons. And yet, the Farm Practices Board has deemed propane cannon use a "Normal Farm Practice". Farmers are just as up in arms about this as urban dwellers who happen to live within earshot of irresponsible blueberry growers. Something has to be done! 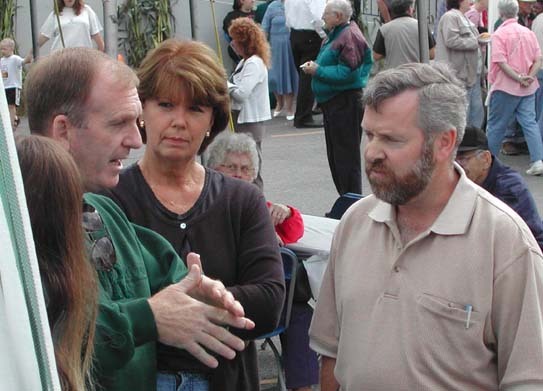 At 1:00 p.m. the Fair's guest speakers began to arrive, one of whom was the Minister of Agriculture, John van Dongen. Our group took the opportunity to spend a good deal of time discussing the propane cannon issue with him. One thing you have to say is that the minister is a very gracious fellow, and never one to duck an issue. 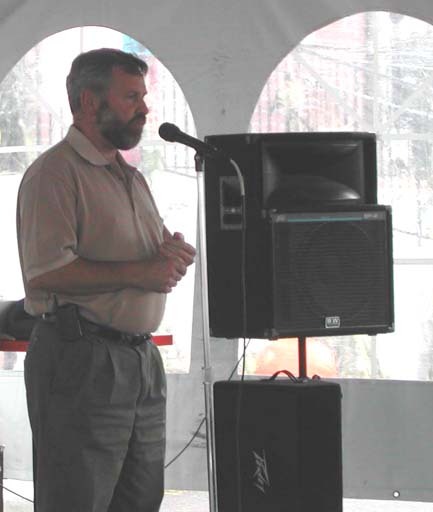 He gave our group as much time as possible before proceeding on to visit the rest of the fair and giving his opening address. Thank you for spending time with our group, John, and we will see you again in October! Thanks to the Aldergrove Fall Fair for helping us spread the word!